North Korea has shrugged off U.S. President Donald Trump’s willingness for direct talks with Kim Jong-Un and ramped up its harsh rhetoric in a clear signal to the leftist government in Seoul. “The U.S.-led unequal international order is now shaken by the roots by our Republic (the North) which has emerged as a new strategic state capable of posing an actual nuclear threat to the U.S. mainland,” the Rodong Sinmun, the newspaper of the North’s ruling Workers’ Party, said in a story titled “North Korea’s Steadfast Stance on Foreign Policies”. The South Korean government of President Moon Jae-In favors accommodation with North Korea and has sought to please both its traditional ally in the United States and the rising and belligerent pro-North Korean regime in Beijing. China bitterly opposes South Korea’s deployment of the U.S. THAAD anti-missile system. 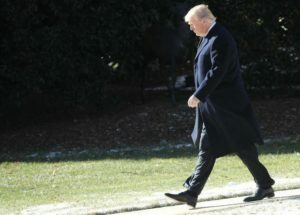 Trump on Jan. 6 said that he is willing to speak with Kim and added that he hopes the two Koreas will discuss “more than just the Olympics” in upcoming inter-Korean talks on the North’s participation in the Winter Olympic Games. The talks are scheduled for Jan. 9. “The imperialist forces, led by the United States, are violently infringing upon other countries’ sovereignty and slaughtering peaceful residents,” the Rodong Sinmun said. “Today’s international situation is calling for the fundamental overturn of an unequal world, in which plots to interfere in domestic affairs of other sovereign states are brazenly enforced by imperialist reactionary forces headed by the U.S., and basic principles in international relations are overtly ignored,” the paper said.